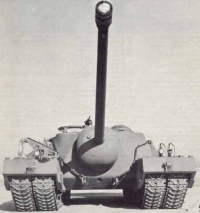 When you first play the T28, you will notice that it is much slower then the T25 AT. This tank is a bit faster than the T95, but not by much, so both tanks are easy prey for fast tanks. The frontal armor is very good for its tier, although the lower part of the armor is weaker. 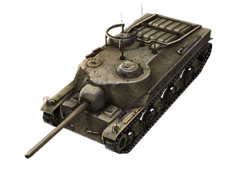 The 120mm AT gun can bring down even the strongest opponents with its rapid fire and good damage and accuracy. The only things the driver needs to worry about are its side and rear armor, as they are quite thin, allowing quick movers to take you down with ease. Be patient, stay in cover, and provide support for your allies and the T28 will prepare you greatly for the monster T95. As such, this tank, unlike the T95 with its extreme frontal armour, cannot really lead a spearhead unless it is top tier. 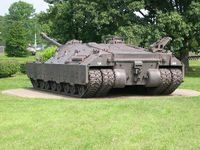 Instead, it should function as a support sniper at mid range, where its small silhouette, large gun mantlet and good accuracy can be an advantage, and the 203mm of armour can start bouncing too. It'a a extremely satisfying feeling when a 122mm shell from the IS-3 pings off your armour. When at top tier, a fully upgraded T28 can become an surprisingly effective street-brawler. This playstyle can mainly be achieved deep in urban areas where buildings can provide cover from flanking LTs and MTs. Try to keep your sides and rear as little exposed to the enemy as possible constantly remain on the move, only stop when attempting mid-range shots and make sure you have team mates close by who can cover you if an enemy manages to slip into your side. One thing most players seem to ignore (intentionally or unintentially) is that the T28 is VERY slow and weak against fast tanks. 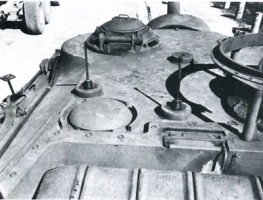 This tank needs other tanks to watch its back while the T28 moves foward slowly. Too many time I play this tank and my teammates ran off, even when there's a medium of light tank harassing me. One thing that the T28 does surprisingly well is watching the flanks while your team is advancing, especially if all of your team's tanks went to one side of the map. Because the T28 is so slow, it's often the last tank in the group. With some map awareness and spotting from teammates, the T28 can be a serious road block for a flanker. All in all, the T28 is a capable tank that can do tons of damage and block a few shots when you need it to. The only thing that stops it from using its full potential is teammates that don't support the T28, leaving it easy pickings for fast tanks. Having a platoon mate with you watching your back can be really helpful, and make this tank much more enjoyable. 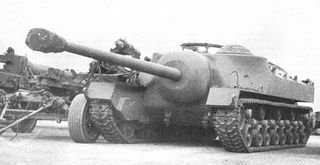 You will already have the 105mm from the T25 AT. Then you should research the engine and the tracks. Research the top 120mm last. This page was last modified on 7 January 2017, at 06:29.